Sony has introduced three new high-definition camcorders that are making shooting 1080 HD video more affordable than ever. 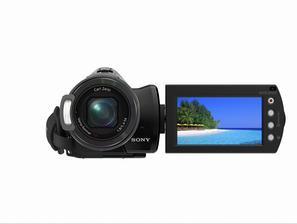 The Handycam HDR-CX7 model is the world‚Äôs smallest and lightest AVCHD high-definition camcorder. It can record nearly three hours of full HD 1080 video on an 8-GB Memory Stick PRO Duo media card (LP mode). The HDR-SR7 AVCHD high-definition camcorder can record more than 22 hours of full HD 1080 video on a built-in 60GB hard disk drive, while the HDR-SR5 model‚Äôs 40GB hard drive can hold more than 15 hours of footage (LP modes). The HDR-CX7 and HDR-SR7 models utilize Sony‚Äôs 3-megapixel sensor for full HD 1080 video and 6-megapixel digital still photos. They are also equipped with Super SteadyShot optical image stabilization to produce smooth video results, as well as virtually blur-free photos. The HDR-SR5 model integrates a 2-megapixel sensor for full HD 1080 video and produces a 4-megapixel photo. Additionally, all models benefit from Carl Zeiss Vario-Sonnar T* optics for increased contrast and true-to-life color saturation. With Sony‚Äôs x.v.Color technology, based on the new international xvYCC color standard, the new camcorders reproduce a much wider data range of colors than the conventional sRGB standard. When connected to a compatible HDTV via the camcorders‚Äô HDMI outputs, home videos sparkle with vivid, natural-looking results. The new models support the AVCHD camcorder recording format based on the MPEG-4 AVC/H.264 codec for video compression and Dolby digital audio. In addition to high-quality video, they provide an exceptional audio experience with built-in Dolby Digital 5.1-channel surround sound recording. The HDR-SR5, HDR-CX7 and HDR-SR7 camcorders will ship in June for about $1,100, $1,200 and $1,400, respectively, with an array of optional accessories.